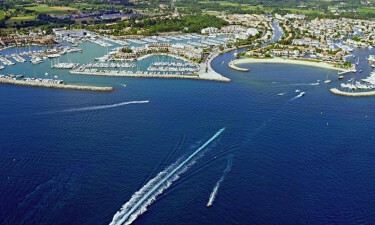 Domaine des Naiades is a holiday camping site straddling the famous waters of St. Tropez and found only 900 metres from the sea. Boasting modern accommodations and a host of on-site activities, camping in luxury has never been easier. LUX-Camp representatives are on-hand to answer any of your questions. 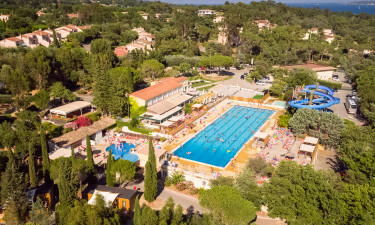 Domaine des Naiades is a holiday camping site straddling the famous waters of St. Tropez and found only 900 metres from the sea. Book your family holiday here! What are Domaine des Naiades’ Winning Features? An incredibly large water park. Many modern amenities for all guests. Balmy weather even during the winter months. A proximity to famous locations such as St. Tropez and Cannes. Shopping has never been easier thanks to the presence of a small grocery store. Most provisions can be found here while a handful of souvenirs can be purchased before one leaves. A bar and a restaurant are found within this holiday camping site. The restaurant is located near to the pool and terraced dining can be enjoyed. The bar is open throughout the tourist season and barmaids are pleased to serve up a drink or an after-dinner aperitif upon request. One feature which tends to define this holiday camping site is a massive water park that is equipped with a heated Olympic-sized swimming pool and a serpentine water slide. There is even a paddling area specifically designed for children. The sandy shores of the Côte d’Azur are certainly famous and they should never be missed during any stay here. These are all found less than one kilometre away from Domaine des Naiades. Modern facilities include a miniature market, a laundrette, a kiosk and baby changing areas for those who plan on arriving here with young children.